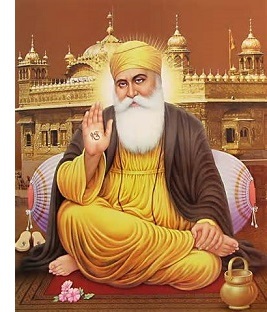 Guru Nanak (1469-1539) - The founder of Sikhism which today has some 30 million followers. Sikhism is one of the few Eastern monotheistic faiths in that it teaches there is one God. However, it is not monotheistic in the traditional sense that God is a heavenly being and the earth is his creation. Instead, it teaches that there is one God which exists in all things. The earth, the sky, humans, plants and animals all have God in them and together they consist of the eternal truth. Nanak was born near Lahore in present-day Pakistan. The ruling power at the time and place of his birth was the Lodhi Dynasty, a Muslim kingdom. He had one older sister, Bebe Nanaki, who is considered an important figure in her own right. She was Nanak's first convert, and therefore is praised as the first Sikh. Nanak is considered the first Guru, and was known to have expressed interest in the divine from an early age. As such, he was recognized by his sister and eventually others to have insight into the divine. Around the age of 30, he is said to have had a vision and then he disappeared. When his clothes were found on a riverbank, he was thought to have drowned. But when he reappeared a couple days later he proclaimed, "There is neither Hindu nor Mussulman (Muslim) so whose path shall I follow? I shall follow God's path. God is neither Hindu nor Mussulman and the path which I follow is God's" Today his teachings are found in the Guru Granth Sahib, which is considered the Sikh scriptures. He spent much of the rest of his life traveling throughout Southeast Asia, the Indian subcontinent and even into the Arabian Peninsula (known as his "Divine Journeys") spreading his message Upon his death, his spirit supposedly passed into the succeeding Guru. There have been a total of 11 of these Gurus. The earliest account of Nanak's life comes from Bhai Gurdas, a Sikh historian who lived about a century after the Guru.